It may appear I’m attention seeking…. But holy mother of God, I fell again….on my back, my head bounced and I heard expletives in the parking garage which could have come out of my mouth but didn’t. The last time this happened, I was in the parking lot of the sheriff’s office, walking Marsha Patterson’s police K9 over to pee when I got wrapped around the leash..this was in November of that year around Thanksgiving. Flat on my back – couldn’t get up – sheriff’s office employees standing over me waiting for the ambulance. I ended up being fine with back muscle pain which lasted over a year…and a total memory that will never disappear! Just to preface…I’ve been doing planks…trying to strengthen up my core..I missed two days and decided Thursday night that I could hold on for 73 seconds…as Friday wore on, I was having some muscle spasms in the same spot as before…we left the auction early. Walking into the parking garage with him carrying a box of dishes, he said ewww that’s slick and told me to walk over toward the door frame – which I did…holding onto it as I tried to walk around onto the dry concrete when BAM. I don’t even notice the muscle pain in my left lower back now. As closely as I can determine, the impact occurred on my right shoulder and elbow. I’m sore but I’m fine. The question to be asked here is how he could walk across the ice with just a skid and me not even able to take a step on the ice …I had no traction. I think this is the difference. 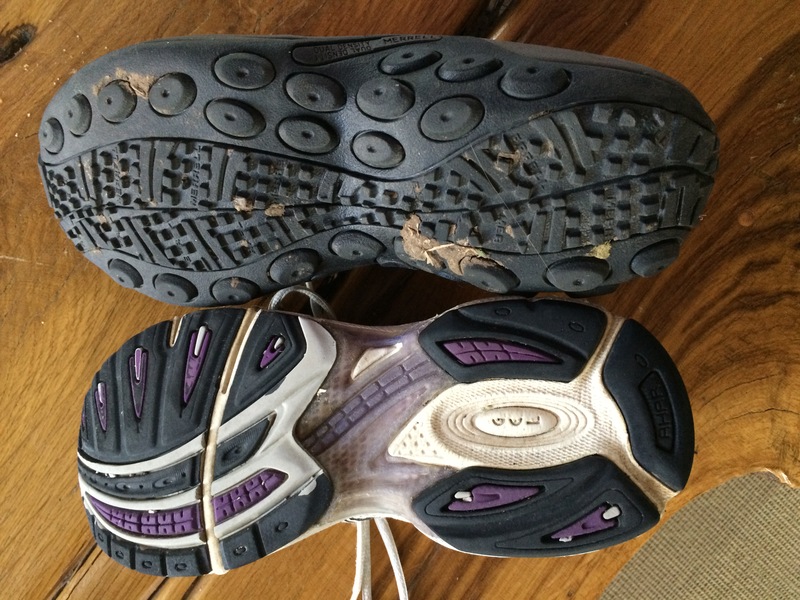 While I figured my tennis shoes (bottom) had plenty of traction – I had a false sense of security – I need to have something more like his Merrills. Which means, darn-it, I’m going to have to go shoe shopping…or…I will just stay home until spring arrives. Decisions, Decisions! This entry was posted in Uncategorized and tagged falls, ice, tennis shoes. Bookmark the permalink. Party trick,huh? I’m probably going to have to get more than 73 seconds for that entertainment!! I have him checking me….its a struggle but I figured building my core was a good way to get it together! I’m hurting like hell tonight..broke down and took a muscle relaxer a few minutes ago…sitting on the couch with heat and ice for 12 hours accomplished nothing. I am so sorry Nina! I remember how bad you were hurt the last time. I hope this is a much quicker recovery. Good for you on the plank. Great strengthener and party trick! Make sure you’re not going sway back and hurting yourself. Have him double check you occasionally. So good to start building those muscles so you don’t have problems later. I love that you are always trying to improve yourself.